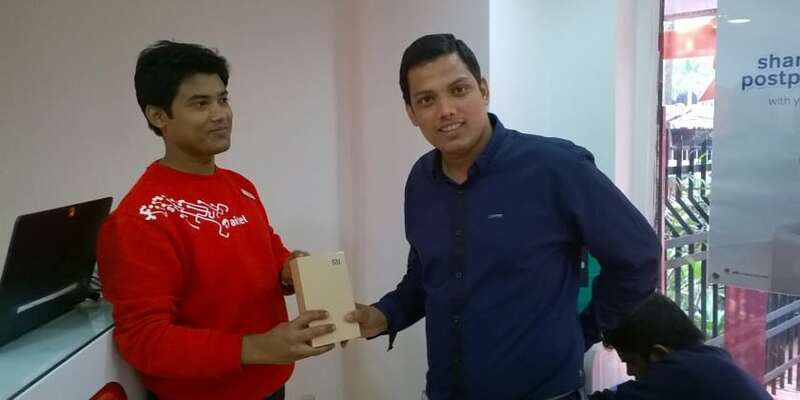 5 January , Kolkata: In yet another first, Bharti Airtel, India’s largest telecom services provider, opened bookings for the Redmi Note 4G starting on January 1, 2015. The Redmi Note 4G, priced at just Rs.9,999/- will be available in 133 Airtel stores across 6 cities – Bangalore, Hyderabad, Chennai, Mumbai, Delhi-NCR and Kolkata. Airtel will also organize a ‘Mi Day’ each week at select stores in these cities enabling customers to walk-in and walk-out with a Redmi Note 4G even without any pre-booking. MiIndia fans can now book their device online and select their preferred Airtel store and date for purchasing the device. Customers can also walk into any of the Airtel stores in these cities to experience the device. While Airtel postpaid customers having at least 500 MB 3G data pack activated on their connection can easily move to the Redmi Note, Airtel prepaid and non-Airtel customers will have to first opt for an Airtel postpaid myPlan when they purchase the Redmi Note 4G. Alternatively, Xiaomi fans could walk-in to select Airtel stores in their city during a “Mi Day” to purchase the Redmi Note 4G without pre-booking the same online. The devices will be sold at these stores on a first-come-first-serve basis. Customers purchasing the Xiaomi Redmi Note 4G will also be provided a 4G SIM and will be able experience amazing 4G speeds on their device in cities where Airtel offers 4G services. Existing Airtel 3G users can enjoy 4G speeds on their new Redmi Note 4G at the same tariff as their existing 3G plan, without activating any special 4G plan. In cities where Airtel 4G services are not yet available, customers will be automatically upgraded to 4G at the same tariff as their existing 3G data packs as and when 4G services are rolled out in these cities. Mi India fans will be able to book the much awaited Redmi Note 4G on Airtel by just visiting www.Airtel.in/mi. Airtel stores will accept various payment modes including Credit Card, Debit Card or Cash. Airtel ushers in the New Year with yet another first, launches Redmi Note 4G at Airtel stores 0 out of 5 based on 0 ratings. 0 user reviews.